I call Rainer Wilhelm at Ocean Independence in Vienna for more details on his new listing, Trehard's 25.05m sailing megayacht _Noheea _and he tells me that: "No stone was left unturned in her recent rebuild. Apart from the aluminium hull everything aboard is new." Delivered in 1991, her rebuild in 2007/2008 saw her fitted with a new engine, generator and decks plus a new set of sails in 2009. Also, a 3.75m 100hp Williams waterjet tender in the lazarette makes her independent of overcrowded marinas. 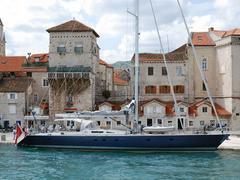 Sleeping up to seven guests in three cabins, _Noheea _is asking €2.17 million.